Composite photo of microwave apparatus used in NIST quantum computing experiments. A pair of ions (electrically charged atoms) are trapped by electric fields and manipulated with microwaves inside a glass chamber at the center of the apparatus. The chamber is illuminated by a green light-emitting diode for visual effect. An ultraviolet laser beam used to cool the ions and detect their quantum state is colorized to appear blue. BOULDER, Colo. – Physicists at the National Institute of Standards and Technology (NIST) have for the first time linked the quantum properties of two separated ions (electrically charged atoms) by manipulating them with microwaves instead of the usual laser beams, suggesting it may be possible to replace an exotic room-sized quantum computing "laser park" with miniaturized, commercial microwave technology similar to that used in smart phones. Microwaves, the carrier of wireless communications, have been used in past experiments to manipulate single ions. But the NIST group is the first to position microwaves sources close enough to the ions—just 30 micrometers away—and create the conditions enabling entanglement, a quantum phenomenon expected to be crucial for transporting information and correcting errors in quantum computers. Gold ion trap on aluminum nitride backing. In NIST microwave quantum computing experiments, two ions hover above the middle of the square gold trap, which measures 7.4 millimeters on a side. Scientists manipulate and entangle the ions using microwaves fed into wires on the trap from the three thick electrodes at the lower right. 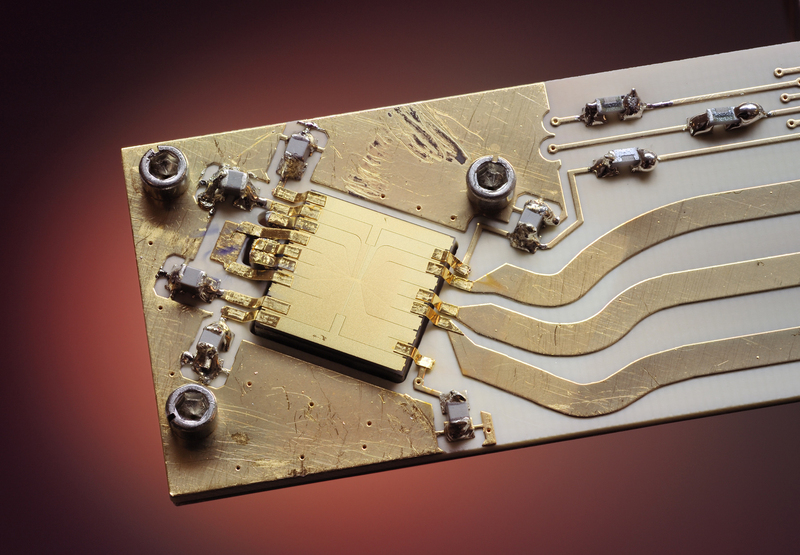 Described in the August 11 issue of Nature,* the experiments integrate wiring for microwave sources directly on a chip-sized ion trap and use a desktop-scale table of lasers, mirrors and lenses that is only about one-tenth of the size previously required. Low-power ultraviolet lasers are still needed to cool the ions and observe experimental results but might eventually be made as small as those in portable DVD players. Compared to complex, expensive laser sources, microwave components could be expanded and upgraded more easily to build practical systems of thousands of ions for quantum computing and simulations. "It's conceivable a modest-sized quantum computer could eventually look like a smart phone combined with a laser pointer-like device, while sophisticated machines might have an overall footprint comparable to a regular desktop PC," says NIST physicist Dietrich Leibfried, a co-author of the new paper. "Although quantum computers are not thought of as convenience devices that everybody wants to carry around, they could use microwave electronics similar to what is used in smart phones. These components are well developed for a mass market to support innovation and reduce costs. The prospect excites us." Quantum computers would harness the unusual rules of quantum physics to solve certain problems—such as breaking today's most widely used data encryption codes—that are currently intractable even with supercomputers. A nearer-term goal is to design quantum simulations of important scientific problems, to explore quantum mysteries such as high-temperature superconductivity, the disappearance of electrical resistance in certain materials when sufficiently chilled. Ions are a leading candidate for use as quantum bits (qubits) to hold information in a quantum computer. Although other promising candidates for qubits—notably superconducting circuits, or "artificial atoms"—are manipulated on chips with microwaves, ion qubits are at a more advanced stage experimentally in that more ions can be controlled with better accuracy and less loss of information. The same NIST research group previously used ions and lasers to demonstrate many basic components and processes for a quantum computer. In the latest experiments, the NIST team used microwaves to rotate the "spins" of individual magnesium ions and entangle the spins of a pair of ions. This is a "universal" set of quantum logic operations because rotations and entanglement can be combined in sequence to perform any calculation allowed by quantum mechanics, Leibfried says. In the experiments, the two ions were held by electromagnetic fields, hovering above an ion trap chip consisting of gold electrodes electroplated onto an aluminum nitride backing. Some of the electrodes were activated to create pulses of oscillating microwave radiation around the ions. Radiation frequencies are in the 1 to 2 gigahertz range. The microwaves produce magnetic fields used to rotate the ions' spins, which can be thought of as tiny bar magnets pointing in different directions. The orientation of these tiny bar magnets is one of the quantum properties used to represent information. Scientists entangled the ions by adapting a technique they first developed with lasers. If the microwaves' magnetic fields gradually increase across the ions in just the right way, the ions' motion can be excited depending on the spin orientations, and the spins can become entangled in the process. Scientists had to find the right combination of settings in the three electrodes that provided the optimal change in the oscillating magnetic fields across the extent of the ions' motion while minimizing other, unwanted effects. The properties of the entangled ions are linked, such that a measurement of one ion would reveal the state of the other. Two authors contributed to the research while at NIST and now work at Leibniz Universität Hannover in Braunschweig, Germany, and Georgia Institute of Technology, Atlanta, Ga. The research was supported by the Intelligence Advanced Research Projects Activity, Office of Naval Research, Defense Advanced Research Projects Agency, National Security Agency and Sandia National Laboratories. * C. Ospelkaus, U. Warring, Y. Colombe, K.R. Brown, J.M. Amini, D. Leibfried and D.J. Wineland. 2011. Microwave quantum logic gates for trapped ions. Nature. August 11.